Teacher’s Comments: An enjoyable parklands/woodlands/marshlands resort course. One great thing about Boyne Highlands is that the resort has Golf Boards for use on The Moor and The Ross course. I played my round at The Moor on a golf board and thought it was terrific fun. 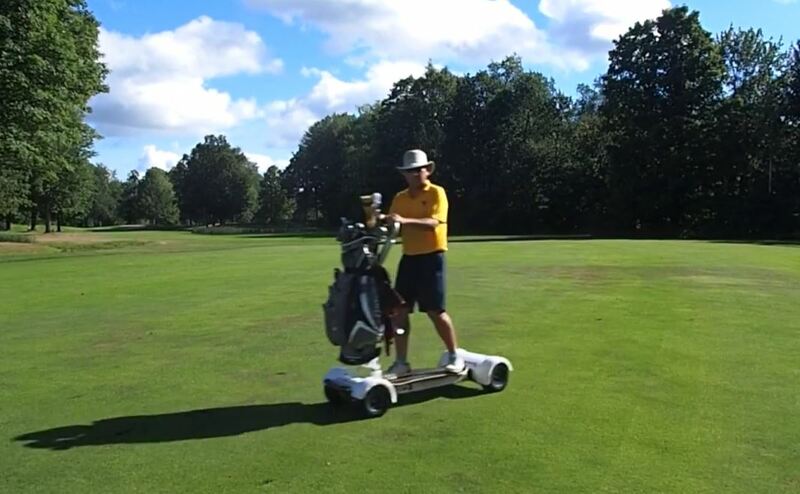 The golf board has all the freedom of walking with the speed of a golf cart. The only issue for me is that I don’t get my walking miles/steps in with a golf board. If you can ski, you already know how to use a golf board. Give it a try. From the back tees, The Moor stretches to 6, 850 yards and plays to a 75.5/144. The middle tees are in at 6, 236 and play to a 70.7/133. In all, The Moor has six sets of tees, with the shortest at 5, 099. I found The Moor to be a very accessible, fun course to play. The fairways are generally wide enough to accommodate inconsistent swings, and all of the trouble is in full view. There aren’t going to be any nasty surprises on a first play. In short, it’s a good resort course. No one goes to a resort to have their day ruined by a dozen lost balls in the woods or weeds, and their scores ruined by hidden hazards. I played the entire round with a single ball — until the last hole, where I decided to take an unwise risk and put a ball in the water. The seventh at The Moor is a 377 yard par 4. My favorite hole at The Moor was the par four seventh. This short par 4 (333 from the middle) plays from an elevated tee, curves gently right, then heads down hill to a green surrounded by bunkers. I don’t normally like greens without an open path in front, but I’ll make an exception for this one. It is short enough that most players should have a short iron in hand for the approach. The par five fourteenth was also a lot of fun. Coming in at 533 yards from the tips, and 503 from the middle, it is a pure grip-it-and-rip-it affair. Hit the ball straight and long, then hit it straight and long again. Repeat as necessary. A view from the fairway prior to the second shot on the eighteenth. The finishing par five eighteenth, however, is positively sinister. Shaped like a large “S”, it snakes around two ponds. Off the tee, the shot must stay right to avoid the pond on the left. If the distance is right, that leaves a player with a shot down the middle line of the S between the two ponds to the next curve. From there, it curves back to the green. A big hitter can possibly send the ball over the first pond to the middle section of the S, taking care to avoid the tree in the middle of the shot. A carry of 275 or so would present a 180 shot to the green. For the rest of us, this is a true three shot par 5. Conditions on the day I played were good. 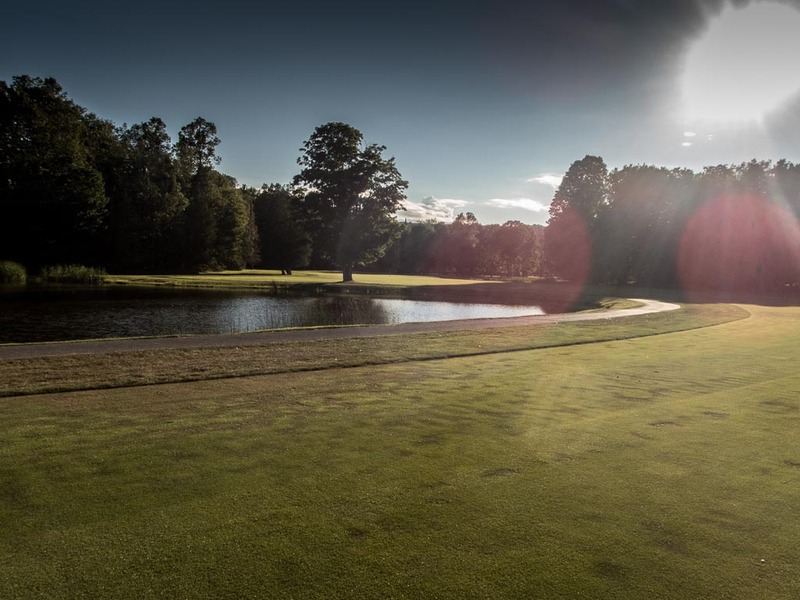 A shortage of rain in Northern Michigan had left things more dry than course management would have liked, with the resulting brown areas in fairways. Tee boxes and fairways were in good shape, though. Still, as a whole, conditions were not as good as I have found at other Boyne properties, such as The Heather, Bay Harbor and Crooked Tree. (Though that may be an unfair comparison, given the premium conditions at those courses). 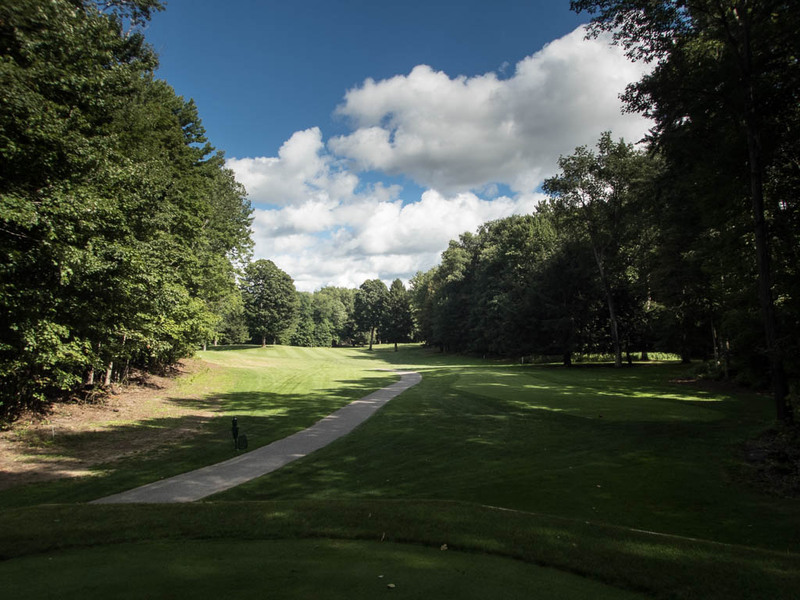 The Moor is a nice part of Boyne Highlands’ course offerings — especially considering the availability of Golf Boards. Along with the other courses at Boyne Highlands, The Moor could be part of a great golf buddies trip. The first at The Moor is a 350 yard par 4. The Moor's second is a 391 yard par 4. The third at The Moor is a 539 yard par 5. The fourth a The Moor is a 208 yard par 3. The fifth at The Moor is a 442 yard par 4. The sixth at The Moor is a 203 yard par 3. A view of the Green on The Moor's par 4 seventh. The eighth at The Moor is a 520 yard, dogleg left par 5. A view around the bend on the par 5 eighth at The Moor. The green is on the far left. The ninth at The Moor is a 408 yard par 4. The tenth at The Moor is a 399 yard par 4. A view from the Fairway of The Moor's tenth. The eleventh at The Moor is a 185 yard par 3. The twelfth at The Moor is a 393 yard par 4. A view of the green on the par 4 12th at The Moor. The thirteenth at The Moor is a 403 yard par 4. A view of the green on the par 4 thirteenth. Can you tell that it's pouring down rain? Sun to the left. Sun behind me. Sun ahead. Dark cloud directly overhead. The Moor's fourteenth is a 533 yard par 5. The fifteenth at The Moor is a 410 yard par 4. A view from the fairway on the par four fifteenth. The seventeenth at The Moor is a 160 yard par 3. 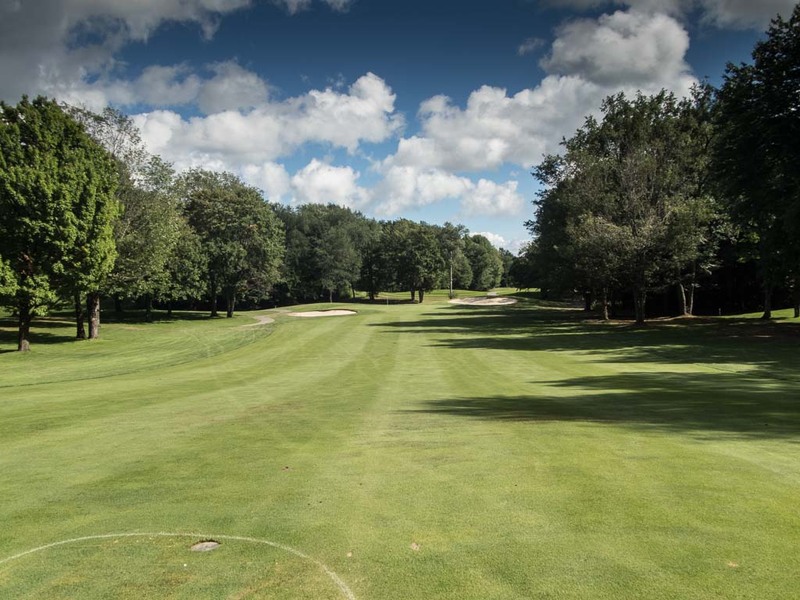 The eighteenth at The Moor is a 525 yard, double dogleg par 5. A view of the green on the third shot on The Moor's eighteenth. The Moor Golf Course Review was first published August 23, 2016.